Spring is almost here! It’s really starting to warm up in Chicagoland and I think everyone I talk to is itching for spring. The snow is melting and soon we’ll have spring flowers peeping up. The lawns will get greener, trees will start to leaf out, and we’ll begin to see little baby birdies and bunnies. Spring is an amazing time of renewal, so in honor of spring, I wanted to share what I consider to be the best yoga poses for renewal. Think about this as yoga poses for spring! Reclined Bound Angle Pose, or Supta Baddha Konasana, is one of my favorite poses to practice when I need to reconnect with myself and my body. At the yoga studio where I teach, we most often have students keep one hand on the heart and one hand on the belly in order to feel the heart beating and the belly rising and falling with each breath. Finding that connection with the breath and the sensations in your body is very rejuvenating! 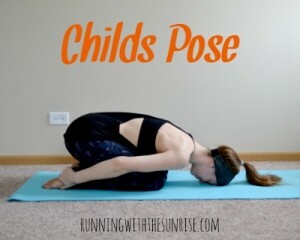 Child’s Pose is another wonderful pose to help reconnect with the body and the breath. The contact of the forehead with the mat helps calm your body and your mind, making it easier to find a meditative state while practicing asana (yoga poses). I learned about “Baby Camel” in a workshop and really love it! In traditional Camel Pose, you not only open the heart, but you also come into a backbend, which can be really intense. 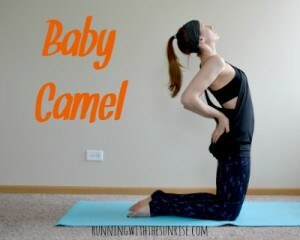 Baby Camel is all about finding an opening through the heart and less about the backbend. That open heart not only feels great for the shoulders, but it also helps remind you to remain open to the things around you, which I find very renewing. Legs up the Wall is one of my very favorite restorative yoga poses. I’ve heard that five minutes of practicing this pose can be like taking a 20 minute nap. 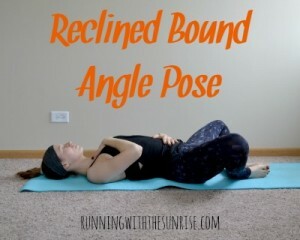 It’s a fantastic pose for runners or anyone with tired feet and legs. 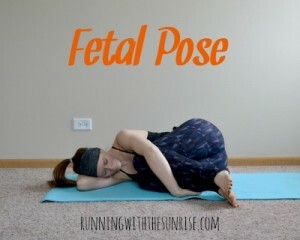 My top pose for renewal and rejuvenation is fetal pose. We call this the “pose of new beginnings” at the studio I teach at because it’s the pose that you started your life at when you were in your mother’s womb. This pose is great to help you feel more refreshed physically and is also a great pose for intention setting. Whenever I feel like I need to reset something going on in my life with a new intention, I’ll practice this pose and meditate on that new intention. Spring is a perfect time to set new intentions because everything is springing up anew! Do you have any favorite yoga poses that make you feel renewed? What’s something that you’d like to restart or renew this spring? I so need these and I am pretty sure I could actually do them without pulling something. I am going away this weekend for a little retreat, I plan on packing some relaxation stuff (face masks and what not) and will be adding these in too! Haha, that’s the goal! Definitely try these poses! They’re gentler poses and they’re really relaxing! Supta Badda Konasana is one of my most favorite ever–a great hip opener, but it is one that makes me feel so much better after. And Thank you so much for including Fetal pose. It is the rebirth, the new beginning, and it is a must at the end of practice! Child’s pose makes me happy 🙂 happy Thursday! It’s a great pose. So calming. i love legs up the wall!!! Me too! Your legs feel so great after doing it.